2016-NOV: U.S. costal areas threatened. Rapid temperture rise in the Arctic. Large poll on climate change. U.S. Costal real estate threatened. Rapid temperature rise in the Arctic. Very large poll about climate change. The general rise of temperatures worldwide are melting the glaciers. Glaciers in Greenland and the Antarctic are two major examples. Ice melting, and the runoff is raising the level of the oceans. Rising temperatures are also heating the oceans, causing them to expand in volume. Jennifer Jurado, the chief resiliency officer in Broward County, Florida said that by the mid 2060's, the ocean level could rise two or three feet in the Ft. Lauderdale area. Handling the problem is going to require an unprecidented level of cooperation among federal, state, and municipal politicians. Water pumps and drain backflow valves need to be installed; sea walls need to be raised; building codes will have to be rewritten; roads will have to be raised. "There has been a definite, gradual increase [in flooding] since the onset of information about global warming. In my mind, there is no question about the relationship. The canal is rising because the ocean is rising." 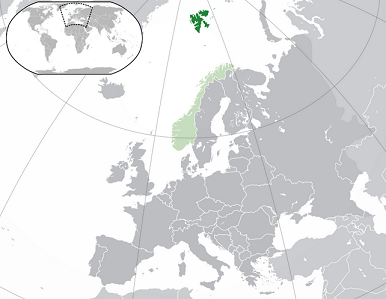 Svalbard is shown in dark green. It is part of Norway, shown in light green. The average annual temperature for 2016 at Longyearbyen -- the main settlement in Svalbard -- could be above 0º C (32º F) for the first time since temperature records were first kept. Svalbard is an archipelago in the Arctic located between Norway and Greenland. It has five main islands and many tiny islands, totalling about 24 square miles, or 62 km2. "This is a little bit shocking. If you had asked me five or 10 years ago, I could not have imagined such numbers in 2016. Svalbard is a very good spot to show what’s happening in the Arctic at the moment. ... There are still huge areas in the Barents Sea and Kara Sea to the east of Svalbard that are free of ice. They should normally be ice-covered." The yearly average temperature has been about - 6.7º C (20º F) in recent years. Each of the past 6 years/73 months has been warmer than average. The warmest annual temperature to date was in 2006 when the average was - 1.8º C (29º F). The temperature in the Arctic is part of a "positive feedback loop:"
As the temperature warms, due to more greenhouse gasses being emitted into the atmosphere worldwide, the area covered by Northern sea ice dimminishes. More of the heat from the sun, which would normally be reflected back into space by the ice, is adsorbed by the water in the ocean. As the ocean heats up, it melts more sea ice. "Should the government increase environmental regulations to prevent climate change?" Yes, and provide more incentives for alternative energy production: 6%. No; provide more incentives for alternative energy production instead: 6%. Unfortunately, although the number of persons responding is incredibly high for a poll, the accuracy of the results is suspect, because the responses do not come from a random selection of American adults. Only those visitors with an Internet connection, who are aware of the poll and its website, and a sufficient motivation to vote would have had their results included.